This is Muymuy. He is my very first Amigurumi project. I had a laptop back in college named Muymuy (yes, I named my laptop). Because I needed to name this project, I called him Muymuy as well :p I made it last year as a birthday gift for my boyfriend, Rob. He placed it on his office desk, so he is reminded of his girlfriend's special talent. Pattern for Muymuy was taken from the Nov. 2010 issue of Crochet! Magazine ("Noggin," p.46) and designed by KJ Hay for Canon International. 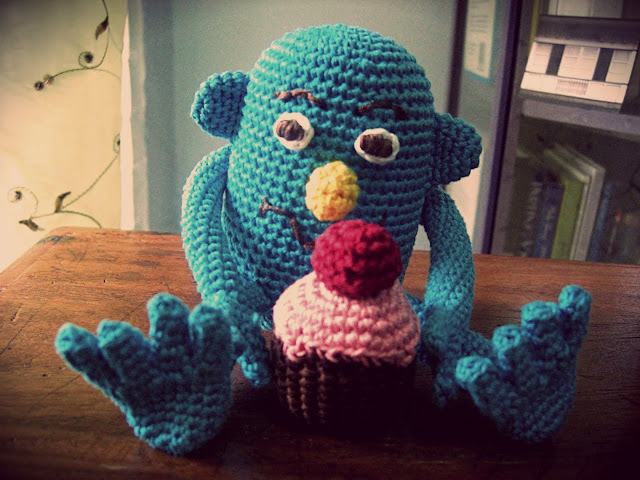 The cupcake pattern was taken from Simple Stitches Crochet book by Carol Meldrum ("Cupcakes," p.108). Yarns used were all Monaco mercerized crochet cotton. 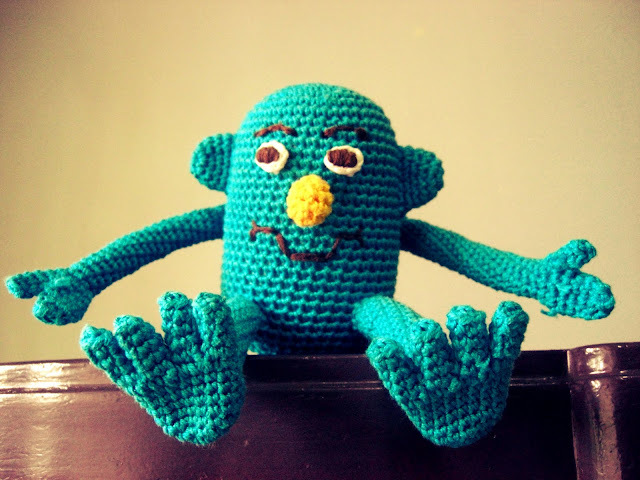 Amigurumi is the Japanese art of making crocheted (or knitted) stuffed toys or anthropomorphic creatures. 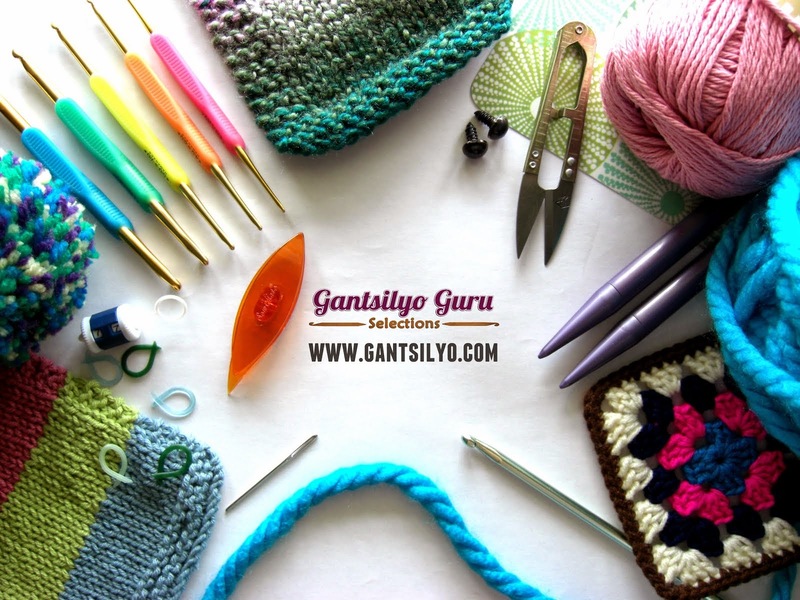 Single crochet is usually the main stitch used for Amigurumi - the stitch is simple but it can do wonders when you let your imagination go. I plan to make more Amigurumis, and will prioritize some requests from friends who want me to make Star Wars characters for them. Hello Trey, where do you get your fiberfill? Hi Lealde! My mom was the one who bought it in the public market here in Pasig. Most likely you can also buy fiberfill in Divisoria. There are many craft stores along Tabora St. where you can most likely buy them. Maybe you can call Carolina's also if they have fiberfill. 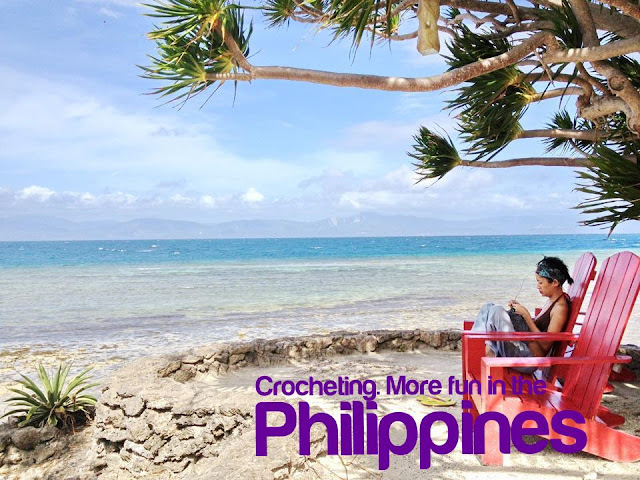 You can check my post last August with the title "My Convenient Source for Mercerized Crochet Cotton" because it has the contact info of Carolinas. what's the size and how much time was spent doing this amigurumi? Hi Maja! This amigurumi sitting down is around 4 inches tall. I think I spent a week on this because I was doing this after work hours.